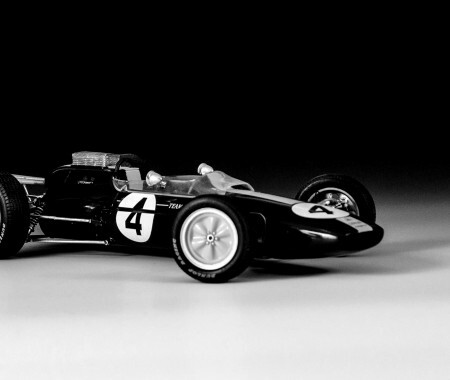 Where do you start with the Lotus 25? Designed by the infamous Lotus brain Colin Chapman, it was groundbreaking in the way it was the first car to use a monocoque chassis, making the car considerably lighter but with more rigidity and there fore better handling and driveability than other designs of that era and paving the route for car design of the future. It was extremely competitive, and was the cause for much ambiguity in the paddock as Chapman wouldn’t let other teams buy the chassis from Lotus, giving them a huge advantage over the rest of the field. Combined with Jim Clarks sublime driving talents, the 25 would bring in a total of 14 race wins over it’s history between 1962 and 1965. This kit was another good one to build, and I did a fair bit of research before had to make the model as complete as I could. the only real issue I found was getting the cowling to fit, after I had tried to add a bit of extra to the coolant hose that runs the length of the cockpit. Alclad Lacquer was used to provide a more realistic colour for the metal parts, the rear suspension was revamped from the kit pats using the wire from some freezer bag ties for what I think is a pretty decent scale representation of the coil springs. the cowling, which came in two part, was made into one piece too, to create a more realistic cowl – I have seen this model built without the join being filled and prepared , and it doesn’t look too good, so I’m glad I took the time to adjust this part. The kit also comes with a stupid looking clear plastic cover for the velocity stacks that poke out of the top of the engine, this was replaced with a scratch built cover from some photo etch mesh…not the easiest but a much better appearance to the finished car. The only other ‘addition’ was the painting of the stripes, rather than using the decals. I wasn’t keen on the kit decals, as they looked a bit insipid. I also thought that the yellow in the bodywork should match the yellow wheels, so a bit of masking practice came in pretty handy.